Temperatures started well below zero Thursday morning, with an official low at DIA of minus 11 degrees! Bitter cold, but still not the record, which remains at 17 degrees below zero in 1936. 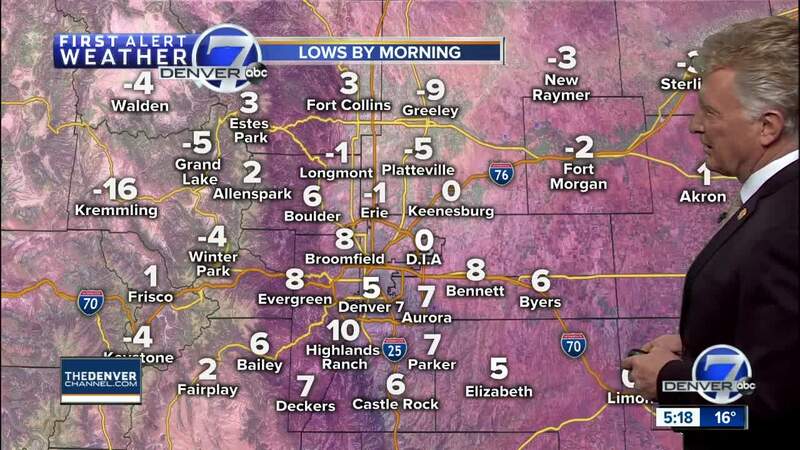 DENVER — Temperatures started well below zero Thursday morning, with an official low at DIA of minus 11 degrees! Bitter cold, but still not the record, which remains at 17 degrees below zero in 1936. Another morning today as lows dip to about 5 degrees either side of the zero mark in the Denver area and over northeastern Colorado. In the mountains, lows will be 10 to 20 below zero in the high valleys. Today will be mostly sunny, with highs back in the mid- to upper 30s by 3 p.m. Mountain areas will mostly be in the 20s with less wind expected. Saturday will be partly cloudy and milder with highs in the low 40s. A weak cold front will bring a few inches of snow to the mountains Saturday night and Sunday, with clouds a slightly cooler weather expected for Denver and northeastern Colorado.